In the aftermath of Superstorm Sandy in 2012, vital components and infrastructure was severely damaged when the tunnels were inundated with over 7 million gallons of salt water. As a result, the 14th Street tunnels were among the last tunnels to open following the gradual restoration of subway service in November 2012. While service continues mostly as normal, the stopgap measures used to allow trains to run normally, the severity of the damage incurred will require a more thorough approach and another long-term closure, much as was required with the Montague St tunnels a few years ago. Ever since the 14th Street tunnels were reopened and it was determined more work was required to get the tunnels back into a state of good repair, the MTA mulled over two options in regards to the tunnel closure. The first option was a full closure of the tunnels and the Canarsie line in Manhattan. The second was a partial shutdown, where one tunnel would remain in service throughout the duration of the repairs. This option would allow for limited service between Manhattan and Brooklyn. However, the cost of having one tunnel open would be that the overall project would take twice as long. Under option 1, the repairs are slated to take around 18 months to completion, as opposed to the three year duration under option 2. After a lengthy process that involved more community outreach than is usually seen from the MTA, the agency decided to go with the 18-month option. While neither option was ideal for riders in the affected communities in Williamsburg and along the 14th Street corridor, the majority of those asked felt that a shorter construction period outweighed the benefits of limited service between 8 Avenue and Brooklyn. That means, starting in 2019 and lasting for approximately 18 months, there will be no train service between Bedford Av, Brooklyn and 8 Avenue, Manhattan. Last year, it was determined which firm would receive the contract for the work. Two firms (Judlau Contracting and TC Electric) are expected to be awarded the work contract for a total of $492 million. Included in that sum is a $15 million incentive to finish the work faster. The 14th Street tunnel shutdown affects many riders not just in the aforementioned areas, but various others as well because of the line's location. As such, riders will need alternatives to get around. In recent months, the agency has released service adjustment details to accommodate the detoured Canarsie-line riders. Additional service will be provided along several lines, including the and lines. As one of the main pillars of alternate service throughout the closure, the service hours of the will be expanded to 24/7 with off-hours service running to 96 Street on the Second Ave line. To facilitate better connections between services, there will be several new out-of-system transfers provided throughout the closure. Riders will be able to transfer between trains at Broadway and Hewes St/Lorimer St , 21 Street and Hunters Point Av and Livonia Av and Junius St . The latter of which will eventually be converted into an in-system transfer as part of an unrelated accessibility project. On the subject of stations, to reduce the levels of overcrowding on platforms expected to see large increases in ridership, the MTA plans to improve capacity at several stations, including Marcy Av, Broadway Junction and Court Sq. The agency also plans to reopen a few formerly closed entrances at Flushing Av, Hewes St and Metropolitan Av . As the agency anticipates many more riders on these alternate routes, they are expanding the length of both the and trains to better handle the crowds. Since many riders will be forced to use buses to travel across the river due to reduced subway access, the MTA and the NYC DOT are rolling out a robust surface plan. This includes shutting down a section of 14th Street to all non-essential vehicular traffic, creating a BRT version of the M14 route and instituting HOV restrictions along the Williamsburg Bridge during peak hours. Anticipating more foot and bike traffic, the city DOT is expected to expanding cycling connections, starting with a new bike link along Delancey St between Allen St and the Williamsburg Bridge. Additional bike paths and better pedestrian areas are in the works including along Grand St in Manhattan and at several key subway stops. In order to mitigate some of the effects of the tunnel closure, the MTA is working with the city to provide cross-river ferry service between North Williamsburg and Stuyvesant Cove in Manhattan. Preliminary plans call for service to run at all times except late nights with expanded Friday and Saturday service during the late night hours. This ferry route will be fare-integrated with both the M14 and M23 select bus service routes. As there will be no service between Bedford Av and 8 Avenue, the MTA will use this rare opportunity to not only fix the ailing tunnels, but to complete some much needed station improvements as well. Elevators will be installed at the 1 Avenue stop, making that station fully ADA accessible. On the subject of accessibility, both Union Square and Bedford Av will receive access upgrades. All five Manhattan stations will receive component repairs, as will several others in Brooklyn. The MTA will also use this time to test out platform screen doors at the 3 Avenue station. If successful, we may see the setup expanded to the rest of the line. Some of these plans are still in the preliminary stages. As more details emerge, this thread will be updated with the latest information. While I will not limit what is posted here, this thread will be moderated with more scrutiny than usual. Please do not flood this thread with your proposals of what should run wherever. Once is plenty. I noticed you said there will be no service between Lorimer St and 8th Ave, wasn't the terminal suppose to be Bedford Ave? Bedford is definitely set up to be a terminal station. Is it known how many TPH the and trains would run during the shutdown? This has probably been asked before, but has the MTA considered splitting the at Broadway Junction and sending trains from Rockaway parkway to Broad street (or maybe up sixth using the other 5tph available on the local tracks)? You could then run the northern segment as a shuttle. I believe it's been considered, but given that capacity over the Willy B is strictly limited, it's unlikely we'd see that service pattern on the . Thanks for the correction. I was mixing up the terminals with the two options. Under the three-year partial closure option, train service would've been completely suspended between Lorimer St and Bedford Av to remove the possibility of a severe overcrowding situation between the two services. As for splitting up the and/or running it to Broad St, as Fan Railer stated, there will likely not be enough room for it. Remember, train service will be boosted considerably when the tunnels are closed off. Combine that with the local and along Broadway and space becomes significantly limited. The is planned to be on 8 minute headways, so most riders will probably avoid the . 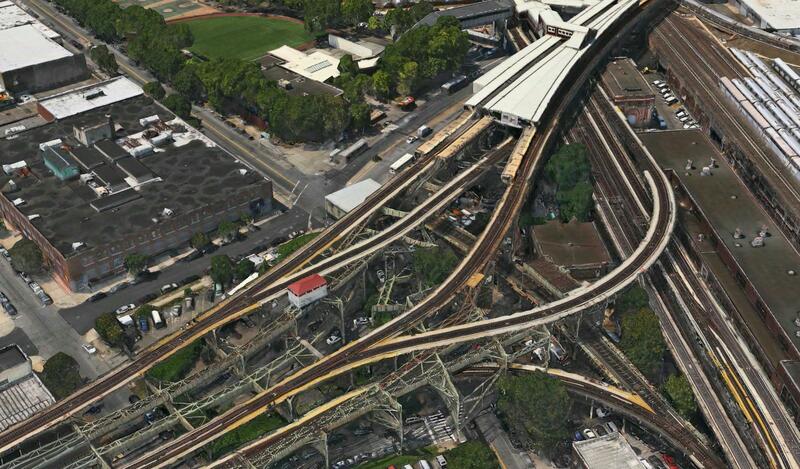 The estimated maximum capacity of the Williamsburg Bridge is 24 tph. At peak hours, expect 12 trains and 12 trains. Can Broad Street turn 12 tph? Metropolitan and Jamaica Center most likely can, but I'm unsure about Broad. If there isn't enough capacity, some trains could be turned at Chambers Street. That is a bit impressive, considering the fumigation that was necessary. The trains must have been well scheduled, all the way from Myrtle to Broad, to achieve it. There were still delays on South Brooklyn-bound M trains between Fulton and Broad, waiting for a or to clear out. It happened almost every time I rode. I forgot to mention that the move that takes the L from Canarsie to Jamaica via the BWAY JCT flyover tracks is a VERY slow move. So that's another non-starter for that plan. I think the flyover tracks are like 10 MPH or something. It’s not as sharp as the curves on either end of Crescent Street. That’s for sure. The curve may be gentler than the one west of Alabama Avenue. To be honest neither directions seems to be out of the ordinary compared to other places in the system. W8th on the , Tremont on the , at Brighton, Whitlock on the which has a super elevation setup. And even compared to its sister line the @ Myrtle. That seems a sharper radius and's no problem there with speed. Question about terminating 12 J/Z TPH at Broad St: If 10 TPH were turned and 8 TPH put through, could Broad St turn and fumigate 12 TPH? Or would 2 or 3 TPH need be turned at Chambers? Alternatively, would the MTA ever put one or two trips through to Brooklyn, perhaps turning at 9 Av on the West End? Well, how many trains are operating currently acrossing the Bridge? 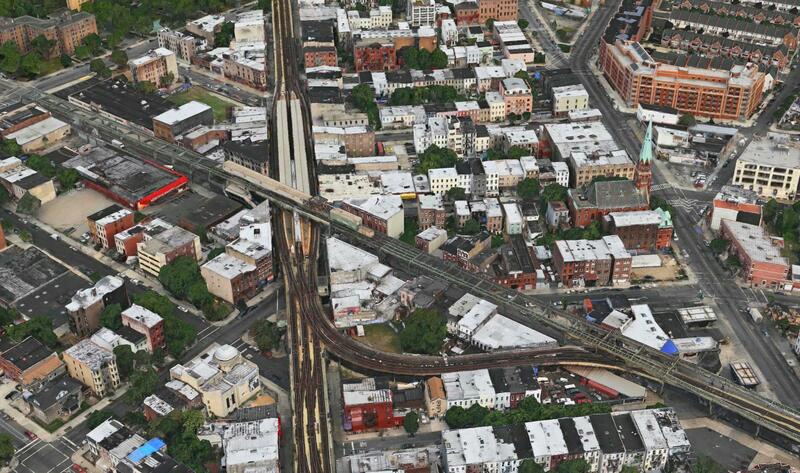 Wouldn't you just extend the from Broadway Junction to Rockaway Parkway? It's a 10 min longer trip how many more trains would you need to add per hour to maintain headways? My point was more around the speed limit on the turnoffs. is not CBTC equipped. The conventional signalling on Canarsie can only handle 12TPH, but the will still be running at 8TPH. I don't see what the big fuss about changing trains is. Most of the heavy ridership on the and main diversion focus isn't out of Canarsie, and the can handle it with 8TPH. I was asking mainly on the speed limit restrictions at Bway-Jct. There was a suggestion to send the via the Bridge just makes more sense to send the if going to go thru all of that. Thus my comment. But I agree the demand wouldn't be there. Transfer options there are plentiful. I was under the impression they were going to run the to/from Broadway Junction only during the Myrtle Viaduct reconstruction project. So far, haven't seen or heard anything about having additional trains continue to run from the Junction during the tunnel shutdown. If they are considering keeping some service at the Junction during the shutdown, then those trains might as well continue on to Rockaway Pkwy. The curve connecting the Canarsie and Jamaica lines can be fixed to handle more than 10 mph if needed. But it would make far more sense to beef up service on the Myrtle Ave el. So far, that seems to be part of what they're planning to do during the shutdown. I actually saw a map showing the split into running both to Metro and Canarsie and the truncated at Broadway Junction sometime last fall. I've been trying to locate the website where I saw it. Not that it really matters because I haven't heard any serious consideration being given to running any kind of 6th Ave service to/from Rockaway Pkwy since the MTA announced the need to reconstruct the Canarsie tunnels. 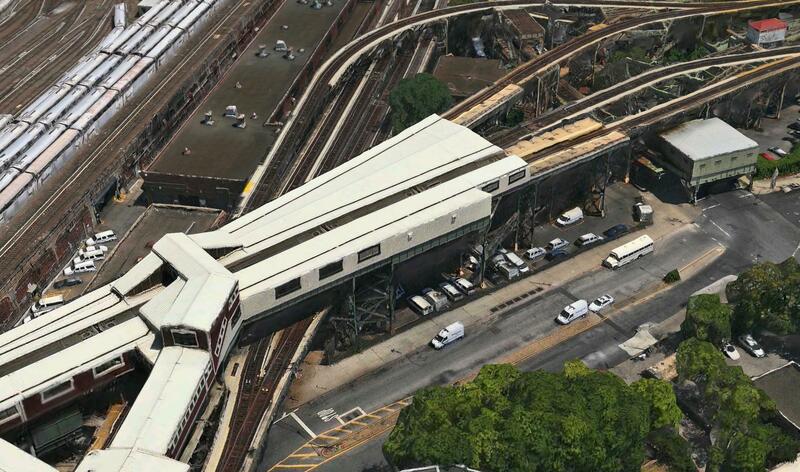 Techhnically, you *can* run non-CBTC trains between at least E 105 Street and Atlantic Avenue on the (not totally sure about Canarsie itself) then run via the flyover to get to the line since there are still standard signal blocks on that part of the line. That doesn't mean they will do it, however.